I finally photographed this old piece that I made for the show '23 Endings' at Latitude 53 back in 2003. It was a really stellar one-night showcase of 23 young Edmonton artists, and it was an honour to be a part of. The piece is called 'A Room to Fool Around In', and is a triptych portraying many of the friends who I felt I was growing apart from after commencing a rigorous Fine Art program. People in it will have to guess at who they are though; I refuse to name names. A friend of mine is pitching this to a band as a CD cover, so who knows...maybe one day you'll see it in the 99 cent bin at your local music emporium (kidding!). 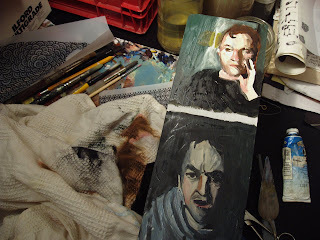 These other pieces are some of the silly work I'm doing now. 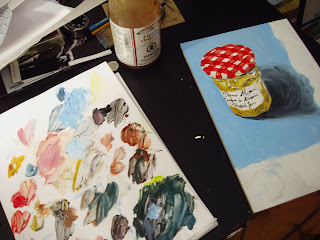 They're all works in progress, more or less, so stay tuned to catch the final product. 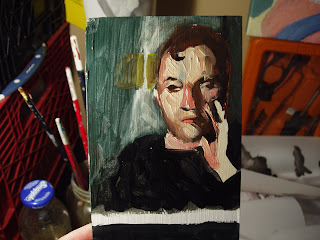 Tiny paintings from Facebook video messages. 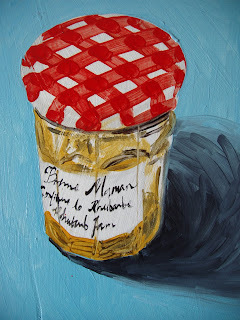 Confiture Bonne Maman - the best jam in the city. 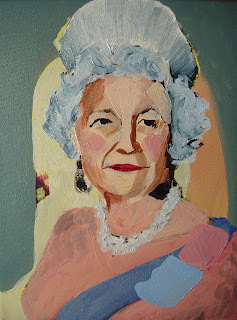 Queen Elizabeth on ecstacy (she's going to have a kind-of red face and big pupils, and a little smile). 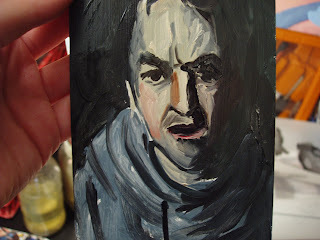 Stephen Harper, Stupid Hamster Face (needs to be more hamsterish). Hey. Thanks for the comment. 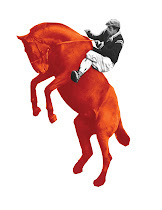 I hope you do get around to making a fake Canadian Club ad, because your art is fantastic. 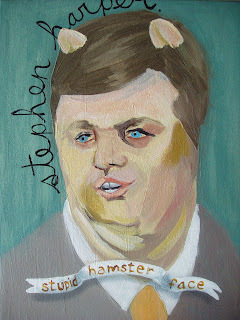 I love the Stephen Harper hamster. I also love those paintings you did of Nina Simone and Angela Davis etc. Are you going to be selling any of those portraits? Thanks Michelle. 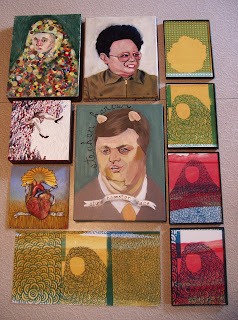 I am selling the portraits, but not individually - for the Hot Topic series, it's all 60 paintings or nothing! It's been tempting, but they have to stay together, really.